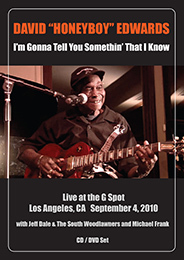 It’s hard to believe that next week already marks five years since the passing of Delta bluesman David “Honeyboy” Edwards. But a new CD/DVD package of a 2010 show from Honeyboy, joined by longtime manager and harmonica player Michael Frank and guitarist Jeff Dale and his band The South Woodlawners, is sure to evoke fond memories of Honeyboy for those who ever had the pleasure of seeing him perform, as well as provide all blues fans a nice listen and look at Honeyboy from the final year of his life. Recorded at Los Angeles’ G Spot, I’m Gonna Tell You Somethin’ That I Know (R.B.I. Media LLC – Pro Sho Bidness) captures a 95-year-old Honeyboy delivering the seated, down-home Delta blues of songs such as his own “Apron Strings” in addition to such classics as Robert Lockwood Jr.’s “Little Boy Blue”, Jimmy Rogers’ “That’s Alright”, Robert Petway’s “Catfish Blues”, James Oden’s “Goin’ Down Slow”, and Robert Johnson’s “Sweet Home Chicago”. Most of the tracks tend to be similarly paced country blues numbers, with songs like “Catfish Blues” and “Apron Strings” serving as the album’s more uptempo offerings, but that doesn’t make this collection any less entertaining, as, for example, Honeyboy tears in on slide on the first of two takes on Rogers’ “That’s Alright”, presents some of our personal blues favorites in “Little Boy Blue”, “Goin’ Down Slow”, and “Catfish Blues”, and offers a patient, satisfying cover of Muddy Waters’ “Country Boy”. While Honeyboy’s lyrics here aren’t always the most extensive or sophisticated you’ll have heard from him, repeating the same sole verse, for instance, numerous times on the opening cover of Howlin’ Wolf’s “Riding in the Moonlight” (here titled “Ride with Me Tonight”) and offering a total of just a verse and a half during a five-and-a-half-minute take of his own plucky “Apron Strings” (allowing us perhaps to focus more closely on his talents on guitar), it’s a joy to be able to watch and hear Honeyboy again, in what would be the Delta bluesman’s final time being filmed or recorded. By this point in his friendship with Honeyboy, Pittsburgh native Frank was of course well in sync with the Delta guitarist and singer, with Dale and his band also nicely backing, but never overshadowing, the Mississippi legend who, seven months prior to this performance, was the recipient of a GRAMMY Lifetime Achievement Award. As good as the music is, it’s the nearly 20-minute talk from Honeyboy at the end of the DVD (the “Somethin’ That I Know” to which the title refers) that’s perhaps the main highlight of the package, with Honeyboy recalling different aspects of his musical career (which began at age 13), including playing with the likes of Robert Johnson, Charley Patton, Sonny Boy Williamson II, Will Shade (Memphis Jug Band), and Big Joe Williams, the life and death of Johnson (who was 26 years old when a 22-year-old Honeyboy started playing with him), and his travels around the world, in addition to offering some good advice to other blues musicians. It may be five long years now since Honeyboy’s death, but it’s nice to see that Dale (who produced and directed the set in addition to playing on it) and others haven’t forgotten him – and indeed probably never will, much the way Honeyboy remembered the greats with whom he played over the decades. This entry was posted in Albums and tagged David Honeyboy Edwards, Jeff Dale, Michael Frank, Robert Johnson. Bookmark the permalink.